When preparing to sell a home, the amount of curb appeal the property has is one of the top focal points that add to the home’s value. Curb appeal is the realty term given to the attractiveness of the exterior of a house, as well as its surroundings. If a home is pleasing to the eye when a prospective buyer pulls into the driveway, it is said to have high curb appeal, which can significantly increase the value of the home. In fact, this factor makes up 70% of the home buying decision, according to many realtors. Some elements cannot be altered, like the house being located directly across from a gas station. However, homeowners can make simple modifications to make potential buyers notice. 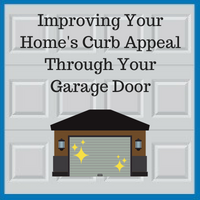 One of the quickest changes that can add long-lasting value to a home is to upgrade the garage door. A door can be a deal breaker just as quickly as it can be a selling point. When designing your garage, be sure to choose a color that works well with the rest of the color palette of the home. Although standing out is a bonus, selecting an abrasive color may cause your home to sit on the market unsold. If your home has brick, siding, or other prominent textures, consider painting the garage door a solid color using lighter hues found throughout the rest of the exterior. Your entrance need not match, either. In fact, many designers insist that they do not match and that the entryway be brighter, thereby drawing more of the street view attention. However, a consistent look between the two adds balance and creates a welcoming appearance. Whether you are selling your home or are just upgrading your home’s visual appeal, a garage door is essential to creating a great first impression. Blue Sky Builders has 39 years of experience helping Chicago and DuPage County residents achieve the perfect look to make their house stand apart in a competitive housing market. Contact us at 630-852-8485 to begin creating your unique look today.